Users licensed for the data service can access our liquefaction database and global exports data. LNG supply has posted healthy sequential gains y/y during the peak winter months of December 2018 and January, led by chunky export increases from Yamal and US terminals. The gains should continue for at least the remainder of Q1 19, as the trains that have begun exporting over peak winter (Yamal T3, Corpus Christi T1, Sabine Pass T5) or will soon be exporting (Prelude FLNG) keep ramping. The year has started with plenty of project activity, but new long-term supply deals have been notable by their absence. Final customs and port data for December 2018 is not yet complete, but Kpler cargo-tracking data suggest global LNG exports were up by 4.5 Mt y/y at a whopping 32.3 Mt that month. That growth comes even on the high December 2017 base of 27.8 Mt. Sequential growth is astonishing at 3.1 Mt m/m—far stronger than expected even given the start of exports from the 4.5 Mtpa Corpus Christi T1 and the 5.5 Mtpa Yamal T3, as even at full nameplate production, those two sites would only be able to add some 0.8 Mt y/y to November 2018 export numbers. Initial indications put January exports near level with December 2018. Yamal flows have been strong, with Kpler numbers putting m/m increments in December 2018 up by 0.34 Mt and January numbers up by another 0.08 Mt, suggesting either a fast Yamal T3 ramp-up or a slow T2 ramp up. US exports followed a similar path, with sequential m/m gains in December 2018 of 0.29 Mt and January m/m growth of just 0.06 Mt. Australian exports continued to grow at a much lower level, with December 2018 exports up by just 0.04 Mt m/m while January is posting 0.19 Mt m/m growth. February numbers could see a little softening as a few train outages in January (Gorgon, Bontang and Sabine Pass) could ease some of the month’s loadings. With the last Australian train to come online—the 4.2 Mtpa Ichthys T1, back in October 2018—likely at the tail end of its ramp-up, Australia will need the 3.6 Mtpa Prelude to start exporting to keep posting m/m growth. The facility has started production, so first exports should be in the next month or so. After that, of trains under construction in Australia, only the 4.2 Mtpa Ichthys T2 (expected online in April) remains. That train is the next train after Prelude that we expect to be online, followed by some 19 Mtpa of US LNG trains expected to begin operations over Q2 19–Q3 19. 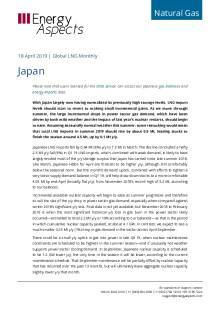 In terms of total LNG exports, we expect Q1 19 will deliver high levels of y/y increments, up by 9.0 Mt y/y. For 2019, we forecast that LNG export growth will be up by 31 Mt y/y, with 2020 providing another 29 Mt of incremental output for the market to absorb.